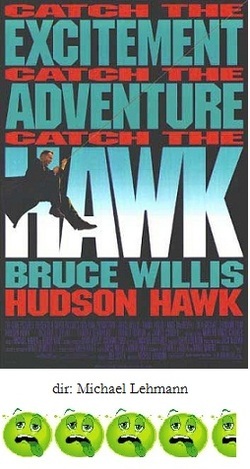 Don't let anyone tell you that Hudson Hawk was unfairly slammed and really deserves a second look, or that it's actually a clever, off-beat flick. Because I'm here to tell you, those people are out of their ever-loving minds. Do you long to see a big-time star smirk his way through a role? Or watch said star let his ego run amok? Do you like pointless, confused, would-be thrill machines that insult your intelligence? Then the empty-headed Hudson Hawk is the movie for you! Bruce Willis, hot off the success of Die Hard, helped come up with the lame story of a really hip cat-burglar (Eddie "Hawk" Hawkins). Joel "I never heard an explosion I didn't like" Silver helped produce; and, according to behind-the-scenes gossip, Silver was so enamored of Willis's comic skills that he encouraged him to basically take over the show; you know, ad-lib his lines, invent his own stunts, and basically run roughshod over the director. The victim in this case was Michael Lehmann (Heathers) who pretty much disassociated himself from this debacle after its flameout opening. Anyway, Hawk gets out of prison and is immediately pressured back into a life of crime by some mobsters known as the Mario Brothers (did Nintendo help finance this?). With the help of his good friend Tommy (Danny Aiello, ever annoying), they break into a museum to steal a rare artifact. To make sure they are out in time they sing a song. You see, as they finish singing, they finish the robbery. So it's done sort of as a musical (which is stretching it once you hear Aiello and Willis actually warble "Swingin' On a Star"). Granted, it's a sort-of clever idea, but, in fact they do this twice more within the movie, throttling this idea until it dies. Hawk becomes involved with the brother-sister crime team of Darwin and Minerva Mayflower (Richard E. Grant and Sandra Bernhard), entrenched with the CIA, and a nun/double-agent (Andie MacDowell). The point is to steal several rare DaVincis which contain the components for his ancient alchemy machine. But, like anyone really cares about the plot. It's just an excuse to watch Willis sing, watch Willis joke, watch Willis smirk, watch Willis act real cool. We are really watching Willis's head inflating with his undeserved self-indulgence. Willis is so busy chewing the scenery and grinning that he forgot that he wasn't funny and that the film was collapsing down around his ears. Hudson Hawk is really a failure on every level. The writing is particularly bad. One scene has Willis falling from a great height and right into a chair across from MacDowell; her response? "Glad you could drop by." HA HA HA HA HA. She even has an embarrasing scene that calls for her to squeak like a dolphin. The supporting cast obviously could see that they had to desperately overplay it, or otherwise get buried underneath Willis's ego. Grant and Bernhard (who provide the only instances of comic timing) shout at the top of their lungs and waggle their tongues at each other, and several CIA agents are inexplicably named after candy bars (Snickers, Almond Joy, Butterfinger and Kit-Kat). David Caruso is Kit-Kat and he wisely plays the role mute, which of course makes it the best performance of his career. Thankfully, the catastrophic response to this turkey, both critically and commercially, proved that the American public wasn't so enamored with Willis's talents, as Willis was himself.